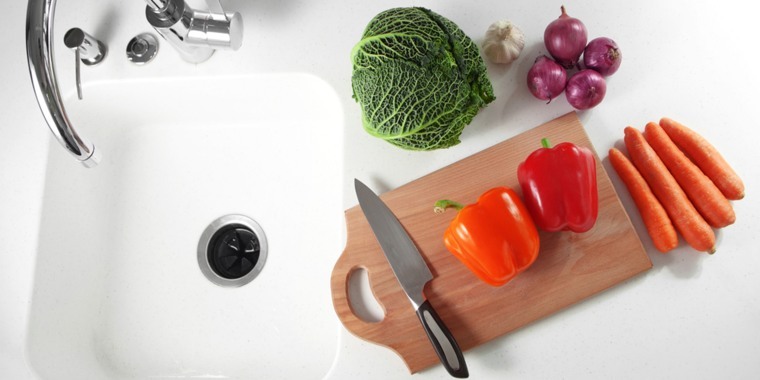 Get rid of garbage disposal smells with these easy tips. The garbage disposal is handy, but cleaning isn't much fun. The thought of putting your hands into that smelly no man’s land sounds terrifying, but there's no need to abandon this cleaning chore. Green-cleaning expert Leslie Riechert shares her best tips with TODAY Home. How often should you clean your garbage disposal? Your garbage disposal works really hard (and can easily get stinky) so aim to clean it on a weekly basis. An easy way to remove food buildup on the blades is to place frozen orange and lemon peels in the disposal and grind them up. The oil from the citrus peels will help remove buildup while leaving behind a clean, fresh fragrance. No peels on hand? “You can also use a tray of ice cubes and ½ cup of baking soda to clear buildup from the blades,” Reichert said. If you have a nasty smell coming from the disposal, there could be two causes: the drain and/or the rubber splash guard. To clean the garbage disposal splash guard: Cleaning the rubber splash guard takes a bit more work, but it’s worth the effort. Slime and gunk that accumulate on the underside of the splash guard are a major source of odors and a breeding place for germs. To tackle the chore, you’ll need rubber gloves, an old toothbrush and hot, soapy water. For removable splash guards: While wearing gloves, remove the splash guard, then scrub the top and bottom of the rubber guard with a toothbrush and soapy water. Rinse and replace. For non-removable splash guards: While wearing gloves, first scrub the top side of the guard. Rinse. Then, lifting up the rubber guard a section at a time, scrub the underside of the splash guard until all slime and gunk are gone. Rinse. For more garbage disposal tips, check out these 10 things your plumber wishes you wouldn't do. This article was originally published Aug. 10, 2015 on TODAY.com.